With an SCP client, WinSCP for example, download the contents of /var/customizations to your local machine. Make copy of the index.html file and rename the file to an appropriate file name. index-gridguard.html for example. Edit the index-gridguard.html file to add the style elements as shown above. Changes have been highlighted in pink. Add a form field for gridId and add the gridpanel element to paint the grid in. Changes have been highlighted in pink. Once the files are altered, upload the changed files back to the NetScaler / AGEE appliance. 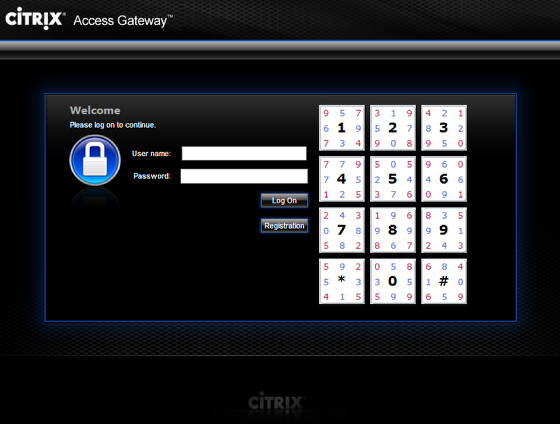 After all the customizations have been applied, this is what the new login page will look like.